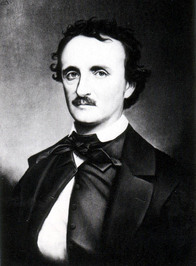 Just as the bizarre c The name Poe brings to mind images of murderers and madmen, premature burials, and mysterious women who return from the dead. His works have been in print since 1827 and include such literary classics as The Tell-Tale Heart, The Raven, and The Fall of the House of Usher. This versatile writer’s oeuvre includes short stories, poetry, a novel, a textbook, a book of scientific theory, and hundreds of essays and book reviews. He is widely acknowledged as the inventor of the modern detective story and an innovator in the science fiction genre, but he made his living as America’s first great literary critic and theoretician. Poe’s reputation today rests primarily on his tales of terror as well as on his haunting lyric poetry.